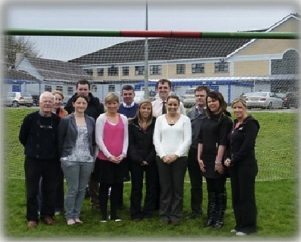 On October 12th 2011, over three years of hardwork came to fruition with the official opening of our school pitch. The Field Development Committee under the leadership of Mr. Mike Nash, have worked tirelessly over the past three years and have fund-raised to the tune of €50,000 for the Field Development Fund. The team, have undertaken many fundraising initiatives including a Race Night, a Field Development Draw, Coffee Mornings, and two Fashion Shows. We are grateful to our parents, staff, students past and present and of course the local community; their support and generosity made the development of our school pitch a reality.